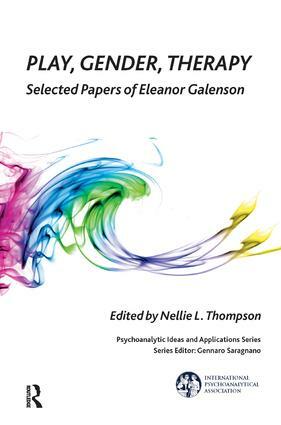 Eleanor Galenson had a remarkable career whose singular focus was her life-long interest in the maturational and psychosexual vicissitudes of infancy and early childhood. The selection of her writings in this volume highlight her approach to the study of the early years of life and, in particular, her contributions to understanding the developmental significance of the very young child's discovery of sexual difference, and the ways in which each child expresses this through play, symbolization and language. Interviews that Galenson gave to Milton Senn and Lucy LaFarge provide a Prologue to the Volume. They introduce the reader to her voice, and portray the milieu within which she matured and worked as a pediatrician, researcher and psychoanalyst. Papers are organized in three parts that illustrate different facets of Galenson's thinking and work: Symbolization, Thought and Language; Infantile Origins of Sexual Identity; and The Tripartite Therapeutic Model. Parts 1 and 2 are introduced by Patricia Nachman and Lucy LaFarge, respectively, colleagues and friends of Galenson who are deeply familiar with her work.